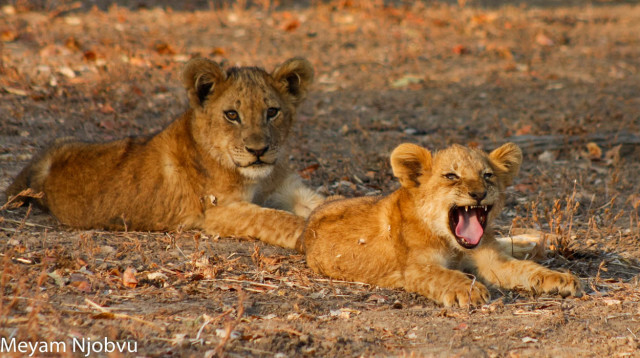 Greetings to all from sunny South Luangwa National Park. August seems to have brought with it a surge of births among the predators of Shenton Safaris’ area of operation, with guests from Kaingo Camp and Mwamba Bushcamp thrilled to see Lion cubs, Leopard cubs and Hyena pups. Following on from July’s newsletter, we are delighted to say we have finally managed to catch a glimpse of the female leopard and her little family. 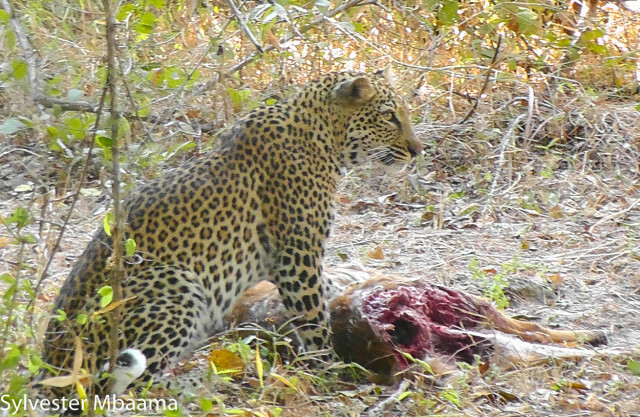 The leopard and her cubs were spotted close to Kaingo Camp by guests as they set out on their afternoon activity! Meyam and his guests were first on the scene. 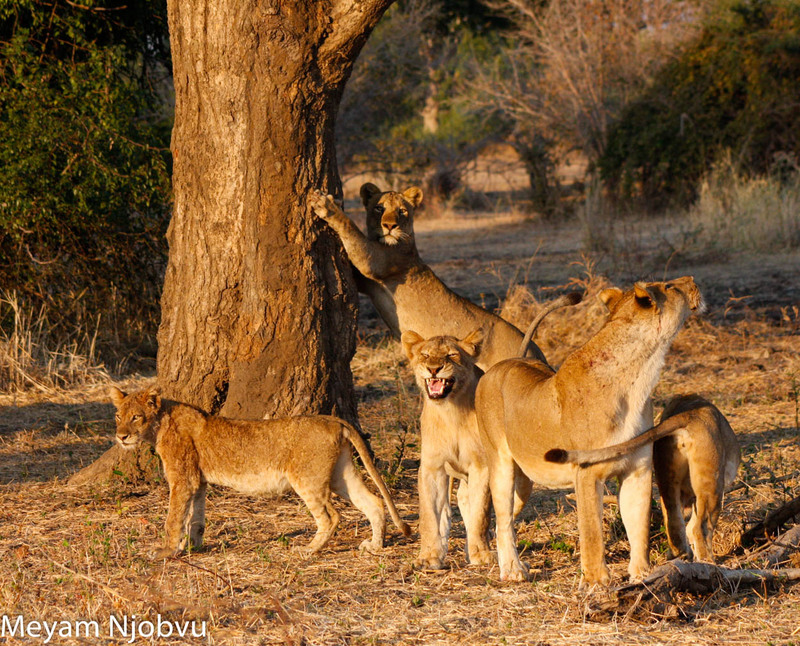 They spotted the small family group as they drove out of Kaingo Camp, past Guinea Fowl Plain toward Hippo Hide. 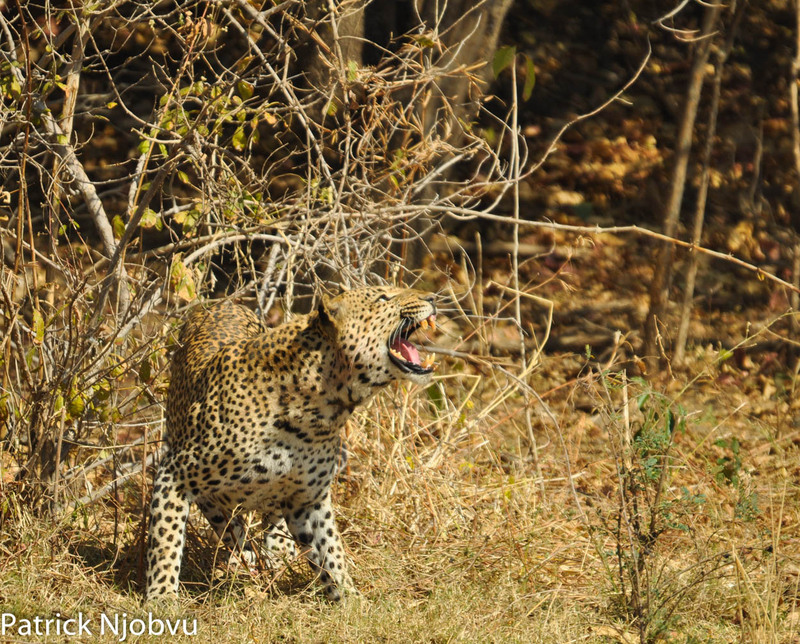 Sue, one of the guests, spotted a leopard moving through the bush with something in its mouth. 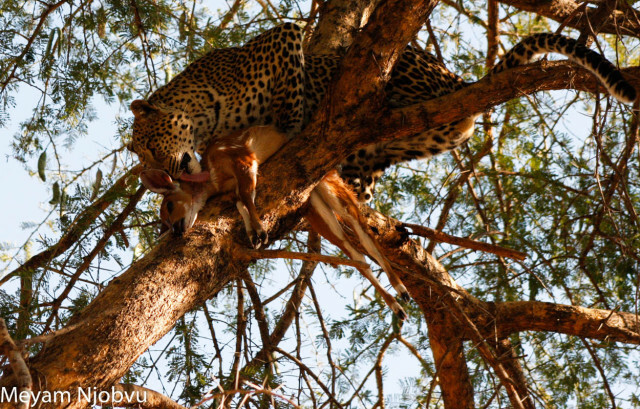 Thinking they had come across a leopard who had successfully secured a guinea fowl for dinner they stopped to watch and what they didn’t expect was to see, was that the leopard was actually carrying . 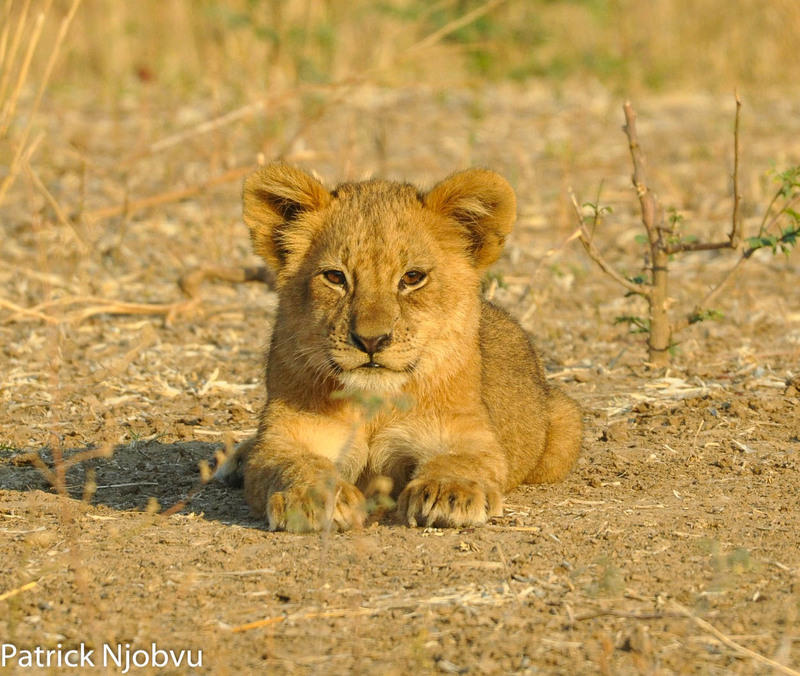 . . a young cub! 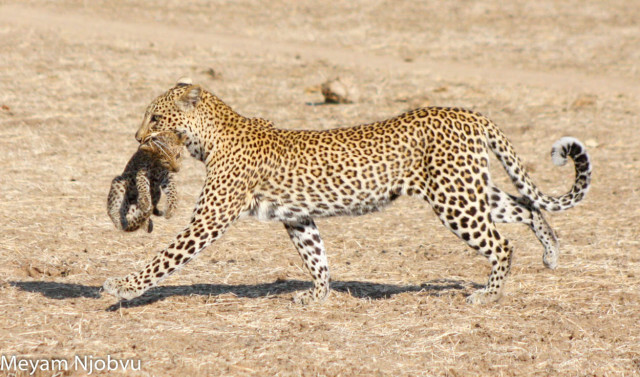 As they approached the leopard, they could make out the tiny creature as it uncurled itself while being held in its mothers powerful jaws. 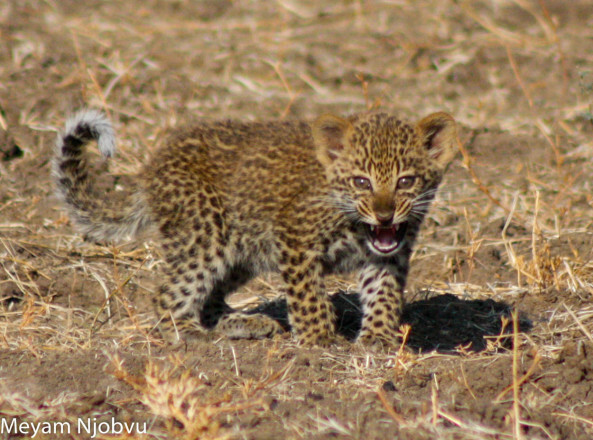 They were even more astonished when they saw the second cub left on the ground, snarling bravely at the approaching vehicle! 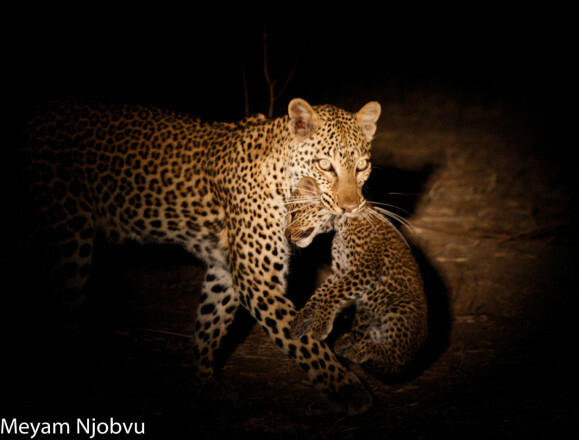 The female leopard had been moving her cubs to a secure location when the vehicles came along and not wanting her little charges to be spotted, she quickly picked up one cub and dashed off, carrying it to the safety of a nearby bush. 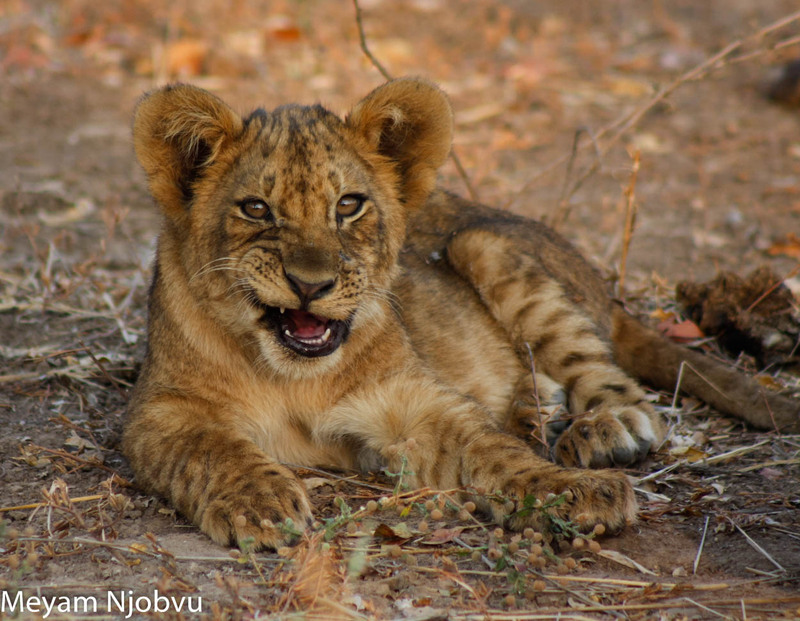 The second cub was too small to keep up and sensibly made its way to the security of a nearby tree, away from our prying eyes. When the female leopard came back to collect the second cub,it would not come down from its hiding place in the tree. The patient animal then took up sentry duty beneath the tree until darkness fell. 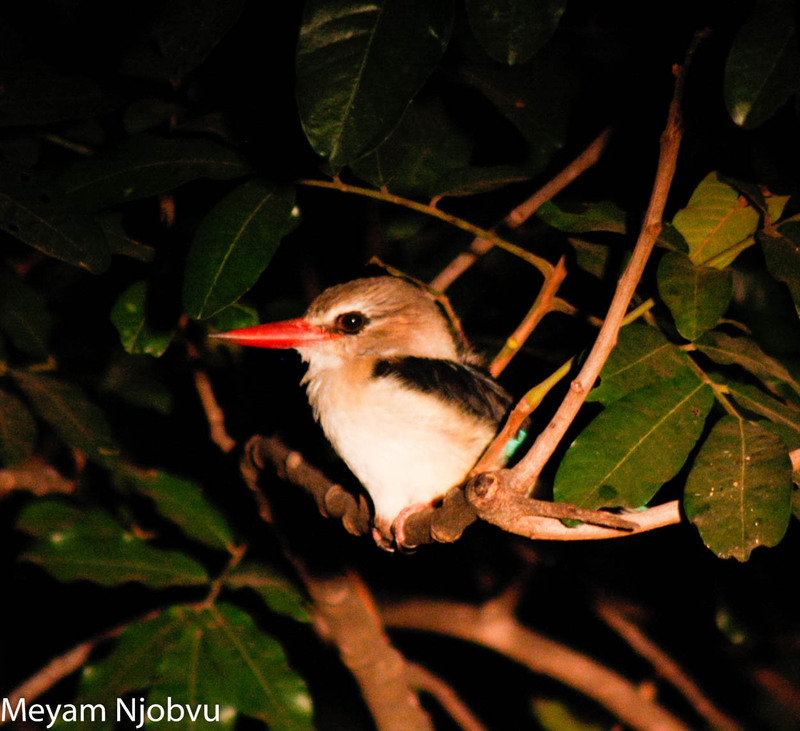 We were all lucky enough to catch glimpses of the small creature hidden among the branches and leaves. 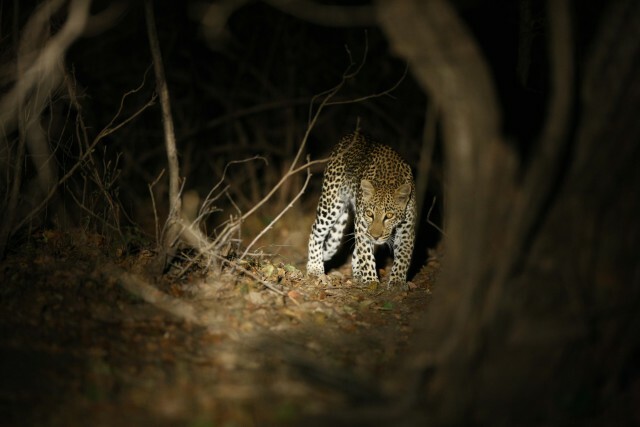 As the vehicles dispersed, four guests decided to wait to see what would unfold so they moved back to a safe distance that would allow the female leopard the space and room she needed to move her cub. 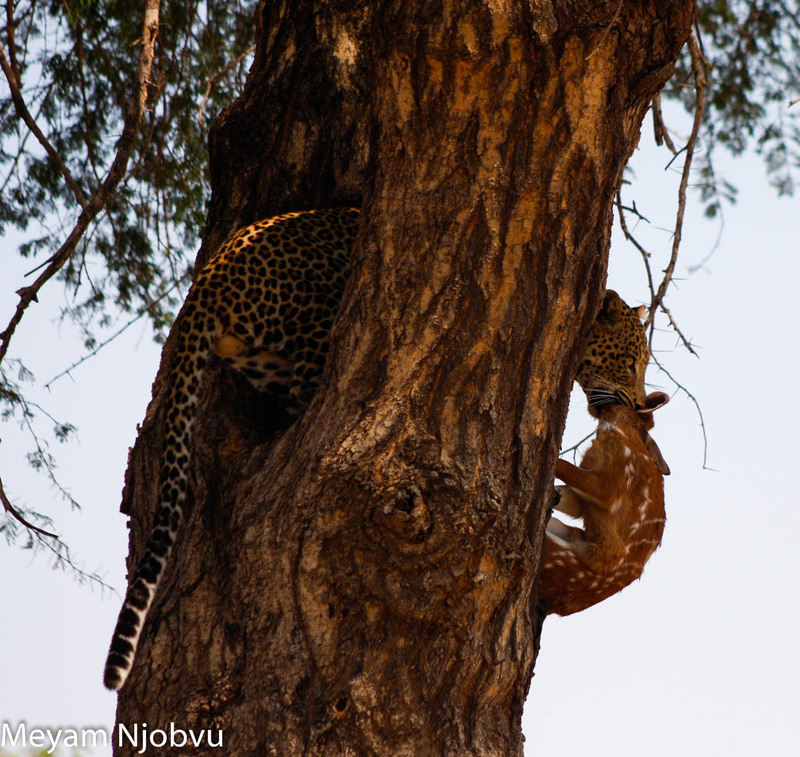 Eventually as darkness fell there was movement in the tree and the little cub appeared and gingerly descended the tree to be reunited with its mother. 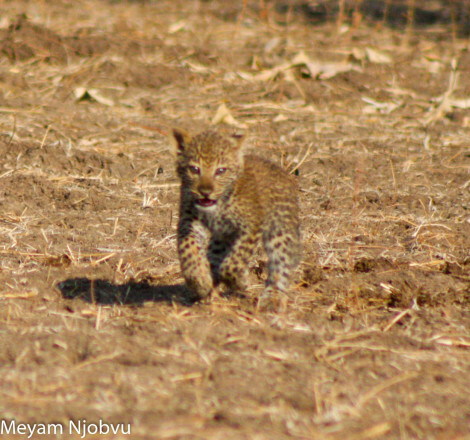 The guests were all delighted and managed to get some wonderful shots of this rare sighting. 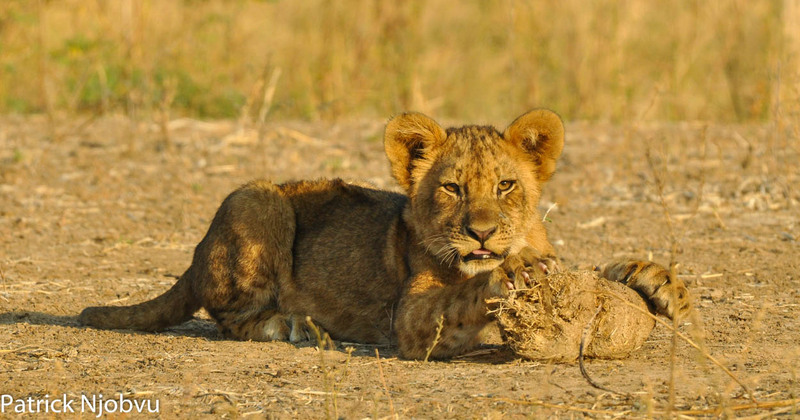 Patrick had a very exciting start to the month when he discovered the Mwamba/Kapanda pride had eight new cubs all between the ages of one-and-three months old and all of whom are in great condition. After the initial sighting, we managed to catch up to them a few times before they headed further inland. 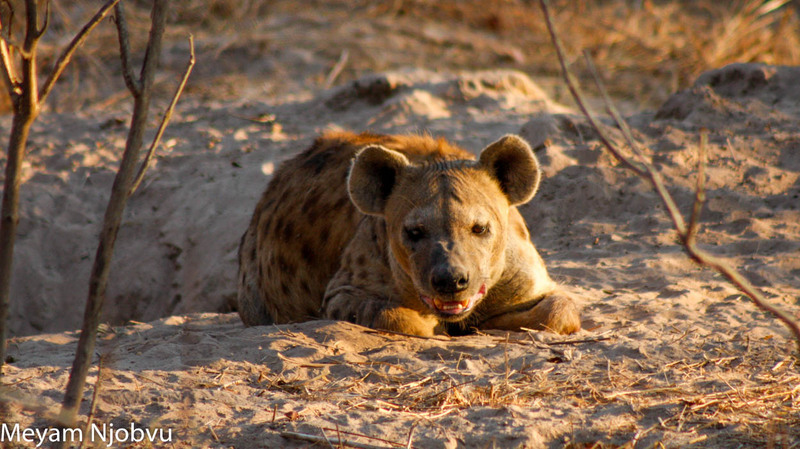 On another afternoon drive close to Wild Dog Lagoon, Meyam was out with guest Jeff Smith, when he caught a glimpse of a Hyaena sunning herself in the glow of the setting sun. 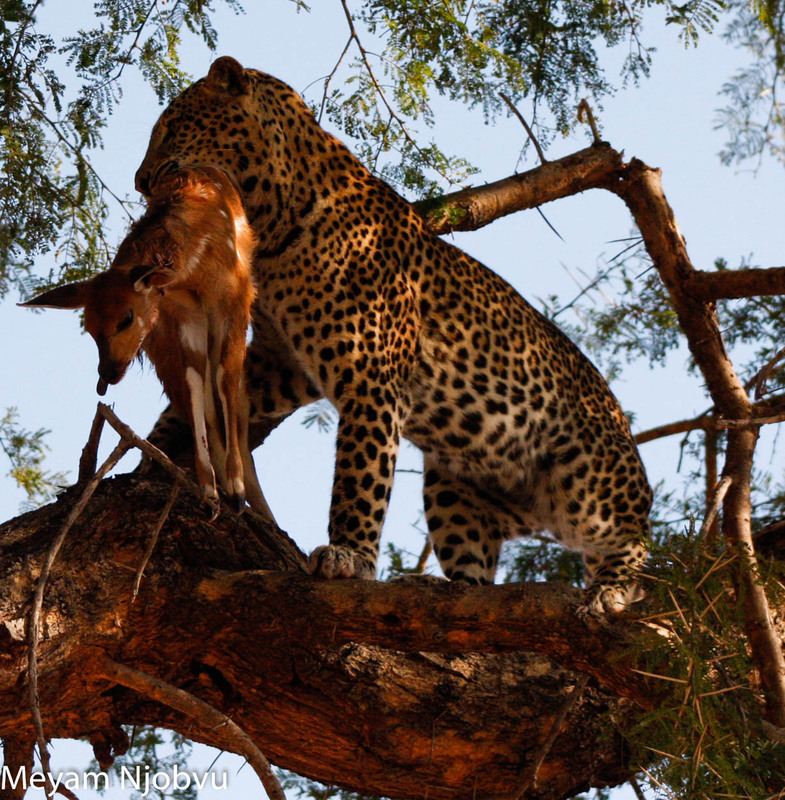 Realising that she could be sitting above the mouth of a den, he decided to investigate further. 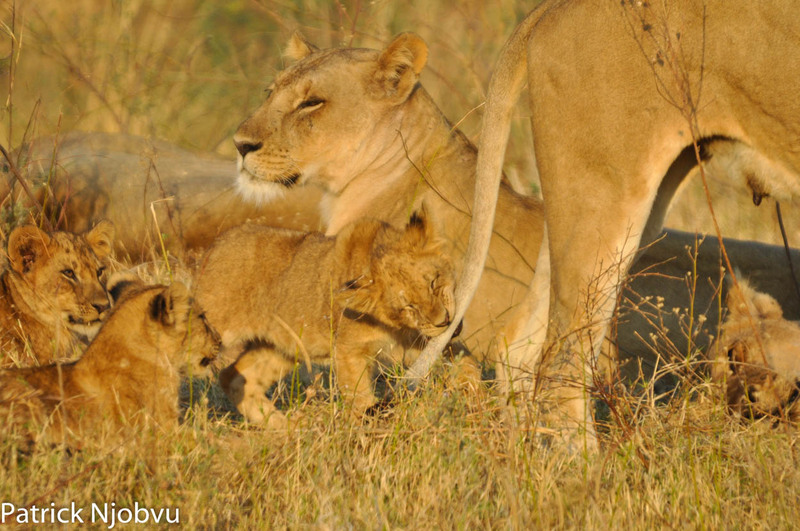 As drove closer to the area, he grew very excited as he recognized that he had indeed found the clan’s matriarch at her den. 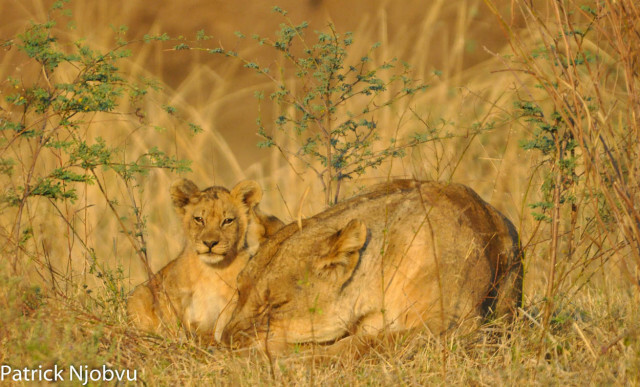 Meyam and Jeff parked at a safe distance hoping to catch a glimpse of any new arrivals but the female had them safely tucked away. 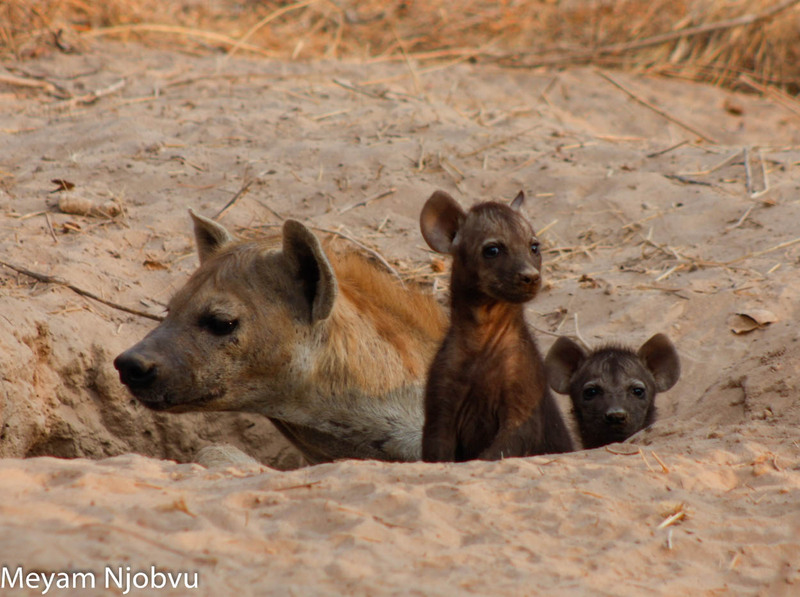 They decided to take a short drive in the area, to see what other activity was going on that evening, so they took off and found a nice area to watch the Sun dip below the African horizon. Once the sundowner drinks and snacks had been enjoyed, Meyam and Jeff returned to the den and were well rewarded with the sight of the female and her two young charges, which were about one month old, out at play under the cover of the darkness. Meyam and Jeff watched in delight as the two puppies played among themselves, returning to their mother at frequent intervals for a little reassurance and affection. 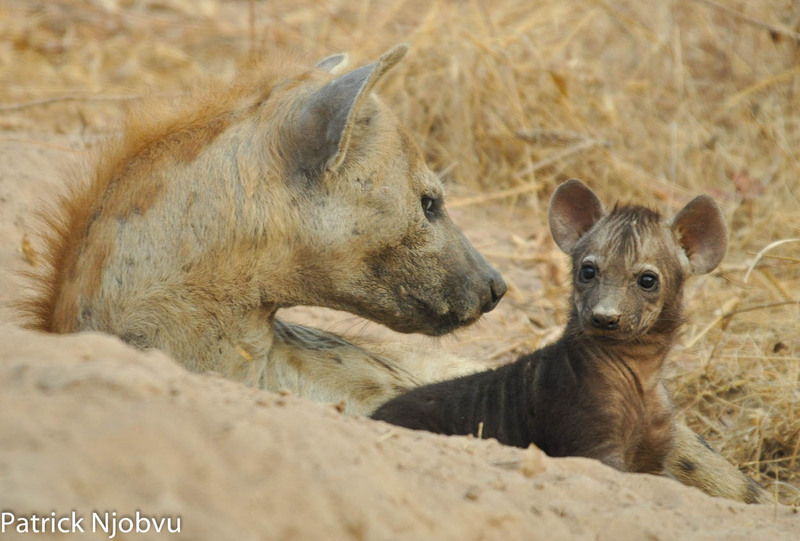 As the month went on the guides visited the den regularly and many guests saw the small family…some just a fleeting glance while others were lucky enough to see the special interaction between the mother and puppies. One day, about one week after the discovery of the den, Matt brought his guests on a visit to the den and was very disturbed to find the area had been trampled by hundreds of buffalo hooves and no sign of the Hyenas. It looked like a large herd of buffaloes had milled around the area for some time. With no sign of the matriarch and her two charges, they left the area. It is often a cause for concern when one finds a scene like this, as buffalo are always ready to take on potential predators, no matter how small they are. And it was most upsetting for us in Kaingo and Mwamba, as the arrival of new life is a precious thing and we like to observe the new generations mature to adulthood. A couple of days later, we decided to take a trip to the den to see if there was any activity in the area. We were thrilled to be greeted with the usual sight of the matriarch sunning herself outside the opening of the den and a short while later a little head popped up! 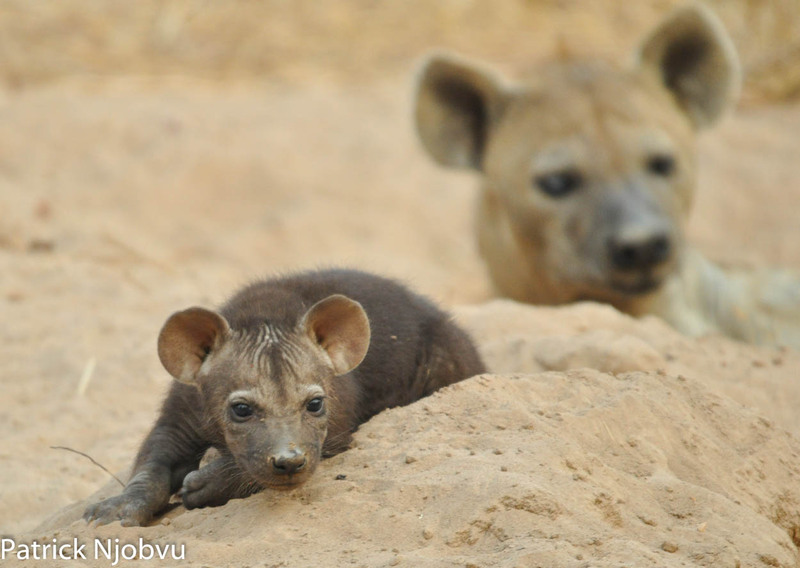 It was play time and a pup emerged to join Mom in the sun. 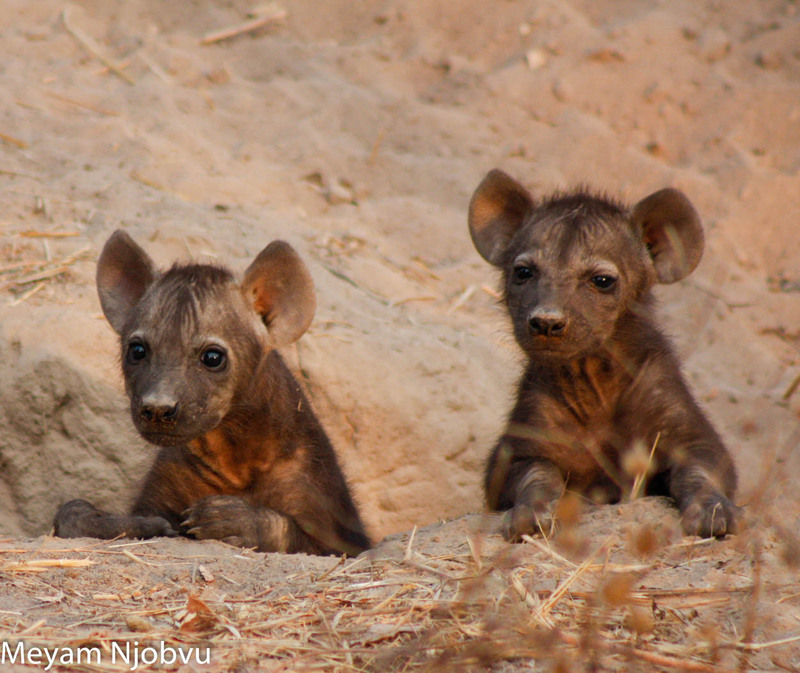 We were sad when the second little head didn’t follow its sibling but were hoping that it was just having a sleep in! It has also been an exciting month at Mwamba Bush Camp, as the surrounding inland water dries up, our camp waterhole has become more and more active, with daily visits from Elephants, Buffalo, Pukus, Kudus, Impalas, Warthogs and Waterbucks, all interspersed with Baboons and Vervet Monkeys, as well as a numerous species of birds. The camp itself has had various late night visitors and early one morning we were awoken by the sound of twenty Hyaenas killing an impala right outside the staffs’ living quarters. 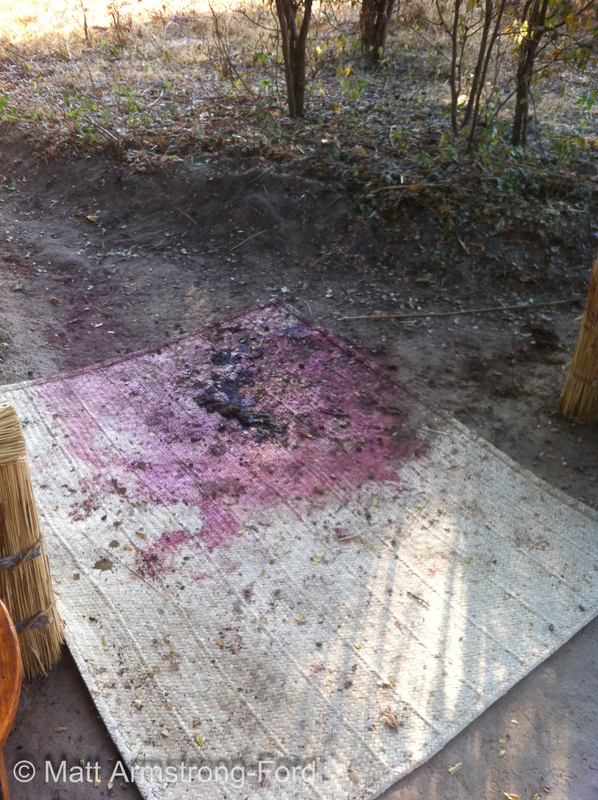 Two nights later, a male Lion killed a Puku in our bar area leaving brightly splashed evidence on an entrance mat! 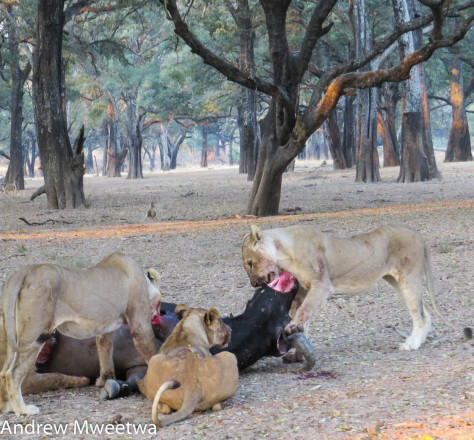 The male Lion was later mobbed by a large number of Hyaenas who managed to chase him away and claim the carcass for themselves. A young bull hippo set up his `territory’ in an ever-shrinking pool in the Mwamba River, safe from the larger bulls that dominate the pools and their resident pods in the Luangwa river. But it is a relatively dry year and the pool was disappearing much faster than he might have anticipated; this would leave him stranded away from water and vulnerable to sun-burn. His condition deteriorated visibly and his gait was slow, but still steady, when we viewed him walking up the dry river bed towards his pool. Unbeknownst to him, he was approaching the Mwamba/Kaingo pride, relaxing on the river banks, watching, waiting . . .. 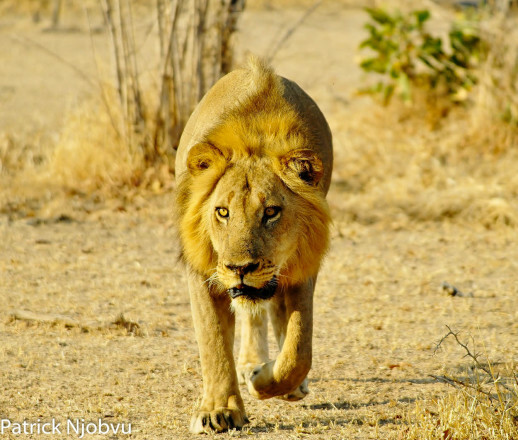 The lions watched his steady approach and then some of the youngsters attacked, sending him careening through the thickets and eventually over the side of the river bank with Lions swarming all over him. The Lions eventually realised that they were no match for the enraged bull when he tossed one young male into the muddy water, leaving him looking decidedly grubby. Three weeks later this young bull Hippo was discovered dead at the Mwamba waterhole, probably as a result of malnutrition. 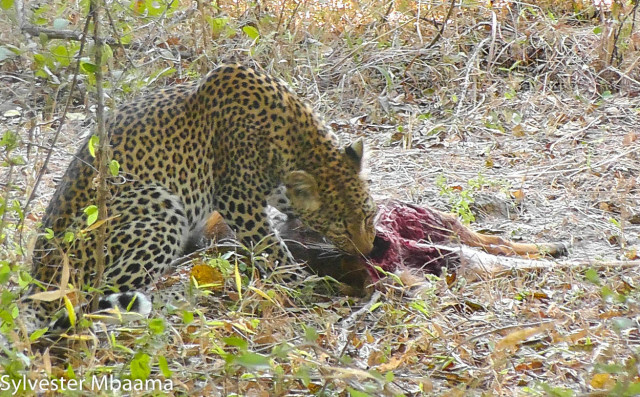 We dragged his body away from the water so as to make it easier for the scavengers to dispose of the carcass. Malaika and Chiphadzuwa have continued to delight our guests at Mwamba Bushcamp with their relaxed demeanours and we are fortunate to be graced with sightings, on a almost daily basis. The interactions between mother and daughter are indeed a special sight to behold . On one such sighting Chiphadzuwa found herself in a spot of bother after Malaika left her alone whilst she took herself off hunting. 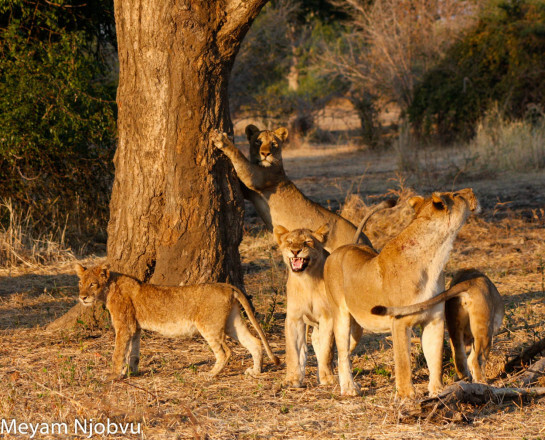 A large troop of over one hundred Yellow Baboons spotted the young Leopardess, setting off a crescendo of barking alarm calls. Chiphadzuwa had clearly discovered the joy of chasing Baboons up and down trees and proceeded to play this game. 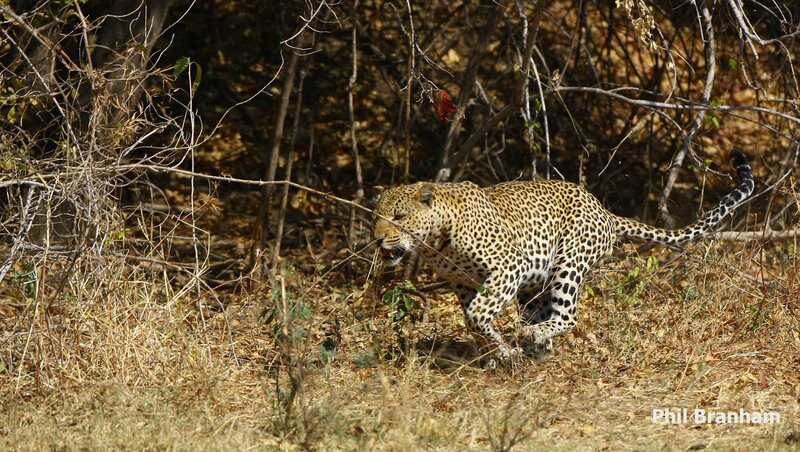 This time however, she unfortunately picked on a large male, who did not turn tail and run but retaliated and the rest of the troop followed suit and began to give chase. She took off in a flash with at least one-hundred-and-twenty Baboons on her tail, barking and screaming their fury and fears. 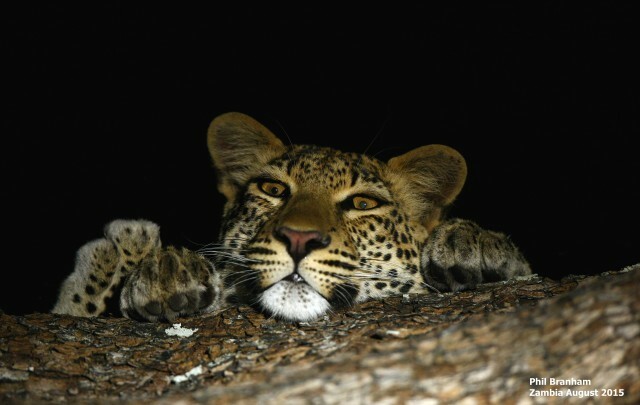 The last we saw of her was a flash of black and gold flying through a thicket with hairy yellow shapes in hot pursuit. 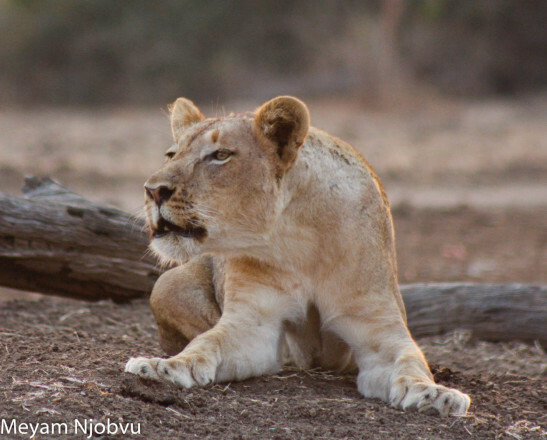 We were relieved to find her the next morning, no worse for wear but hopefully with a new found respect for adult male Baboons. And Patrick was fortunate to be able to show to his guests a male Leopard’s abject hatred of Vultures . Vultures are the primary culprits in revealing the whereabouts of carcasses to scavengers, because Lions and Hyaenas watch the movements of Vultures in the skies above. 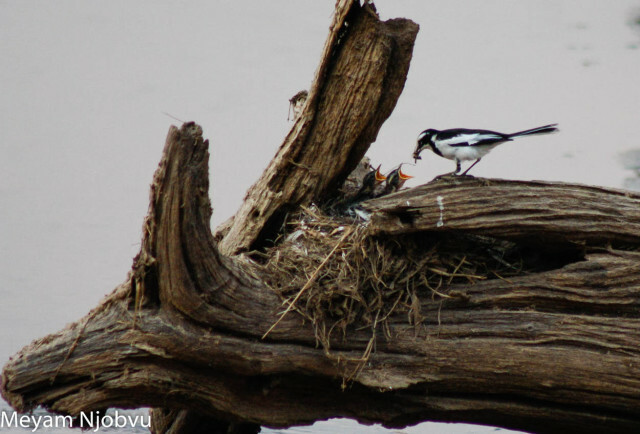 They follow their flight paths and will run to the area where large numbers of Vultures are seen to be descending; the result, very often, being an easy meal. 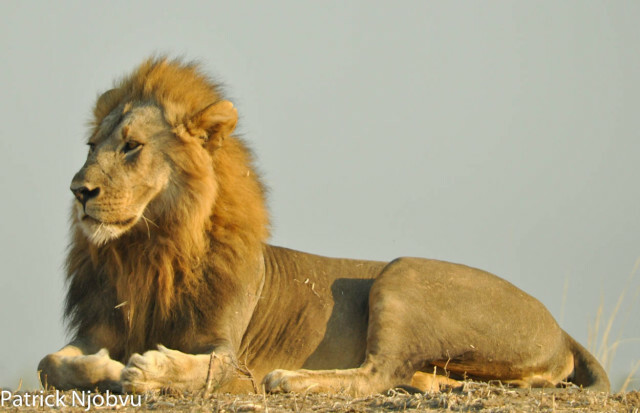 Other than the viewing of their cubs, we have not seen much of the Mwamba/Kapandas, but the Mwamba/Kaingo pride have been in some serious action involving Buffalo, Hyaena and visiting adult, male Lions. They managed to bring down a large bull Buffalo on the banks of the Kamima stream. After they had consumed most of the meat, approximately nineteen Hyaenas arrived and drove them off the sparse leftovers. They had no sooner settled into some shade under the nearby Gardenias, when a large nomadic, male Lion charged into the scavenging Hyaenas, scattering them to the four winds. 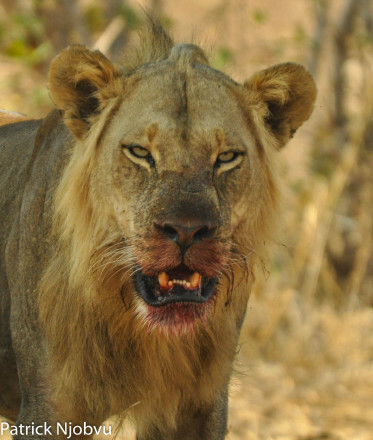 He stayed and fed for a while before noticing the pride under the sweetly-scented trees, whereupon he immediately left his meal and charged the pride. 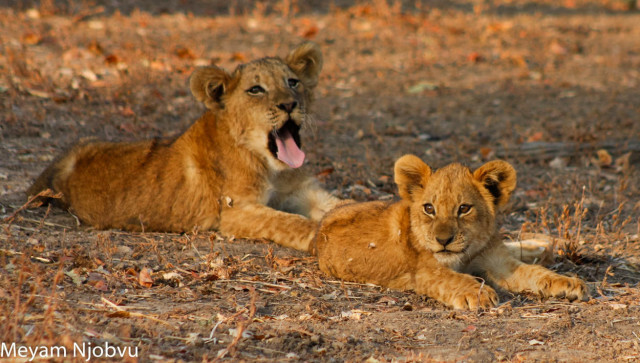 The young males fled, tails between their legs as the old male singled them out for his attentions. One of them ran so far and so fast he only reunited with the pride three days later! The adult male then returned to his meal but stopped short as he noticed a young Lioness ensconced in the shade. She signaled that she was receptive to his attentions by flicking her tail up, down and all over the place, but when he advanced upon her she moved away, enticingly always just beyond his reach. A large young male Lion has mastered the art of bringing down young Buffalo on his own! 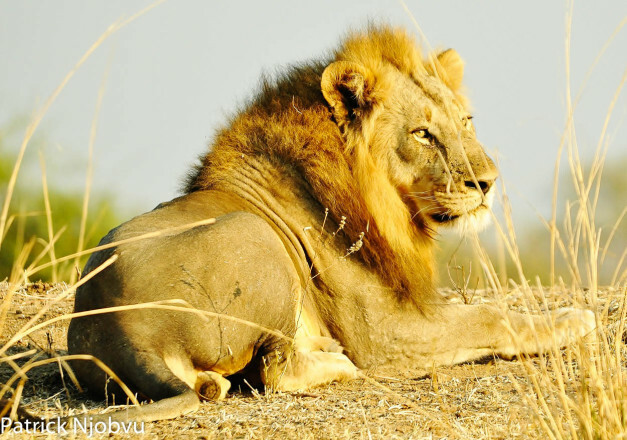 Isolated as he was, he sat and ate to his elegant sufficiency over three days, unmolested by Hyaenas and other Lions. 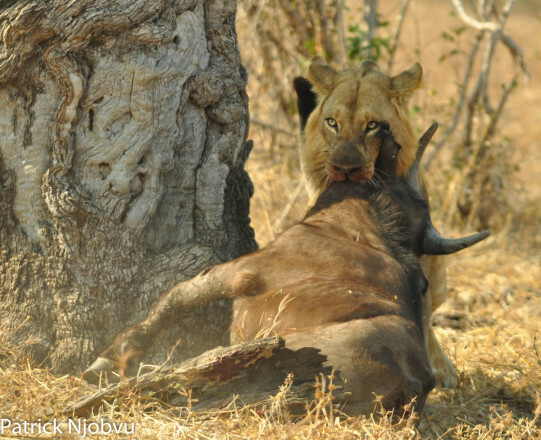 The Mwamba/Kaingo pride killed another bull Buffalo, this time in the Ebony grove, close to the spot where Derek & Jules were married. 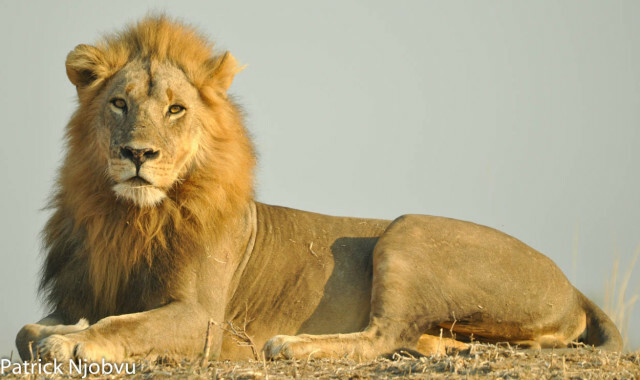 Sylvester and the Marshall family were first to reach the kill moments after it had occurred. The nine Mwamba/Kaingos had brought this bull down so swiftly and efficiently that we had not even heard his bellows of pain at Kaingo Camp, which is mere minutes from the grove. 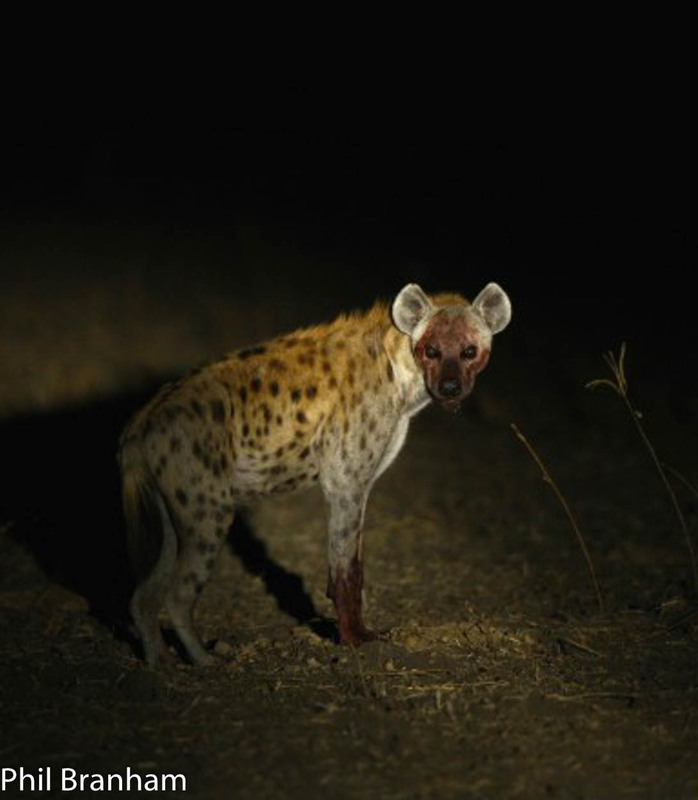 They fed on the carcass, undisturbed for most of the night, until at approximately four o’clock in the morning the whooping of Hyaenas challenging for the kill, awoke the whole camp. The guides and guests were chomping at the bit to get out and view the action and none could wait for the appearance of the sun; Andrew and the Jones family took pole position and were first out to view the spectacle. 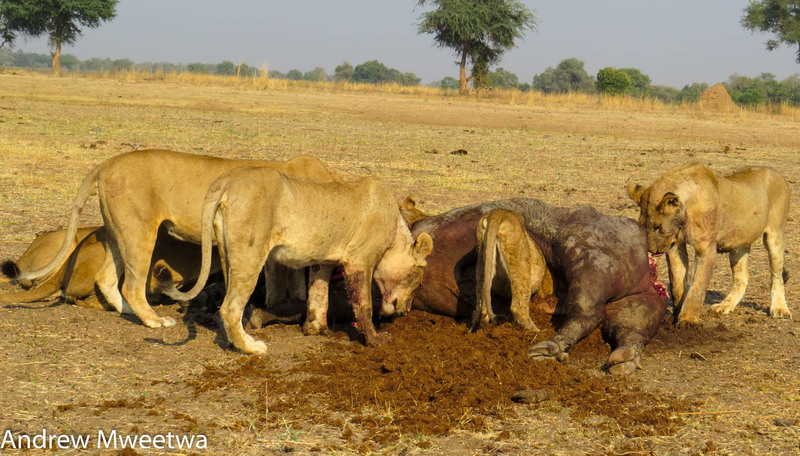 The same Hyaenas had again driven the Lions from the carcass and were busy extracting every last scrap from it. 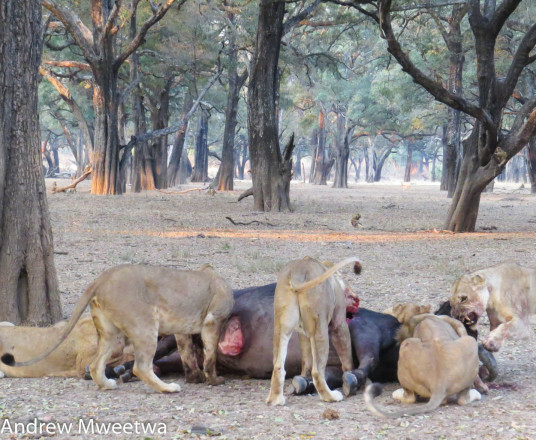 The Lions had surrendered completely and moved away to sit under some Mahoganies as they digested their second massive meal in five days. Andrew and his guests were by this time joined by Patrick from Mwamba and Sylvester with the Marshalls’. 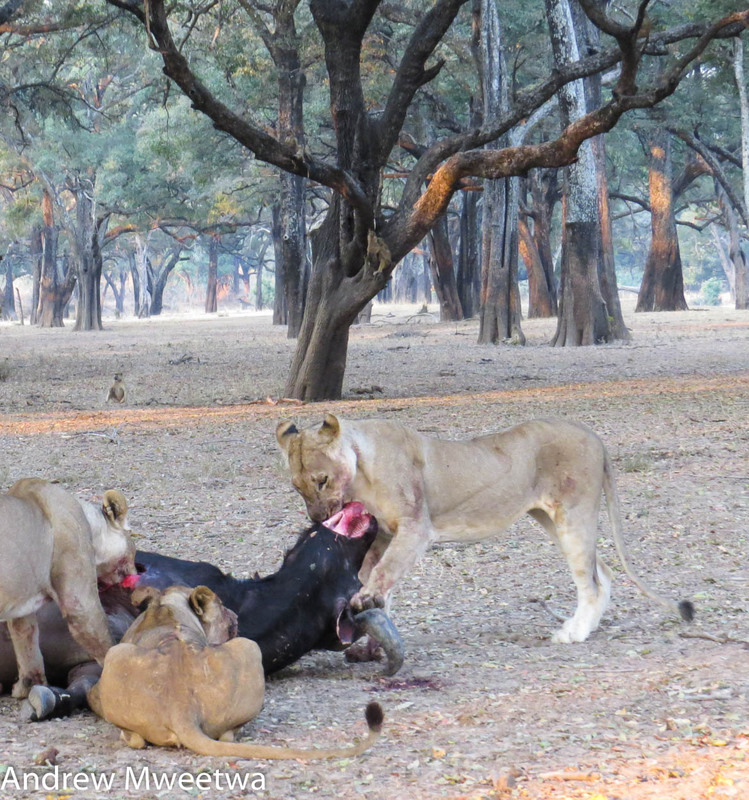 Suddenly the same big adult male Lion charged upon the scene again, and again scattered the giggling Hyaenas all over the grove. 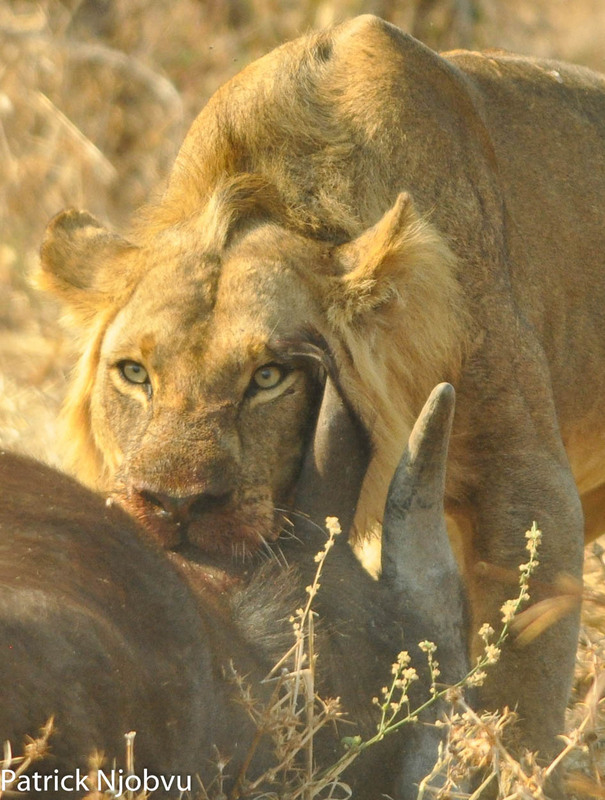 He fed contentedly for a few minutes until another, younger male Lion crested the banks and advanced on the carcass. then suddenly stopped and he too sat, then they both lay facing one another, chests heaving as they contemplated the folly of running in the mid-morning heat. The beautiful male Leopard nick-named Mapolo-ya-molilo by Daryl Balfour, killed a young Bushbuck and the distress calls attracted the Hollywoods, who instantly treed him. 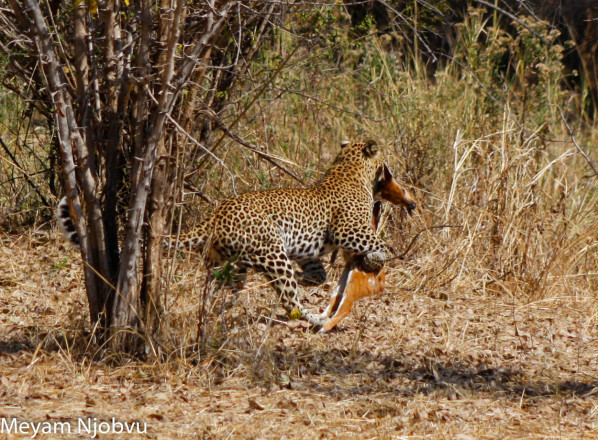 He managed to hang on to his prey despite numerous attempts by them to get at him. 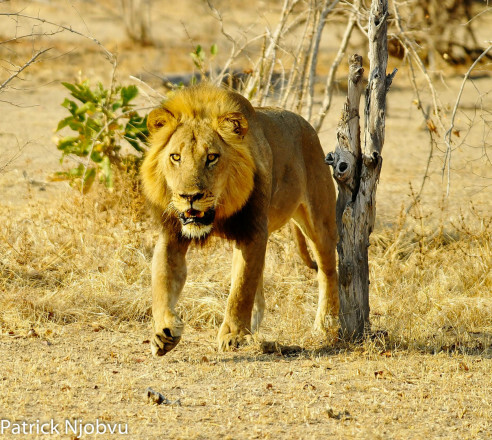 Eventually the Lions followed the shade cast by the tree and moved far enough away, allowing the Leopard to descend and sprint away with his hard-earned meal. The famous Hollywood Pride has also been in other action when two of their females managed to bring down an adult Warthog. The watching guide and his guests were horrified when, during the bloody feeding, the Warthog began to thrash and squeal. 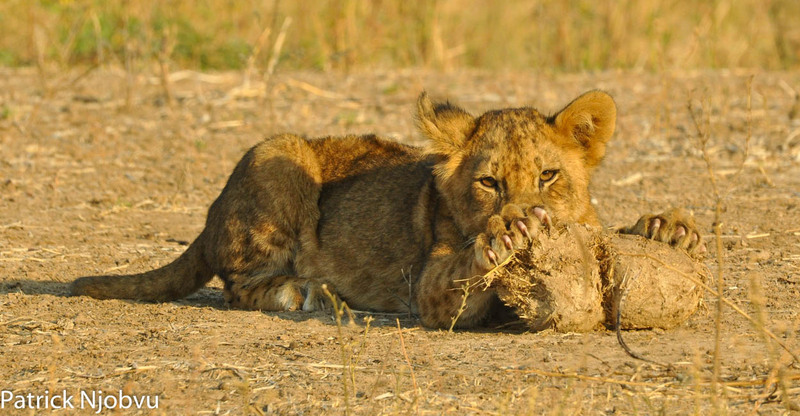 The Lioness feeding closer to his head, placed a massive paw on him to stop the threshing and continued to feed. The video is available on to be viewed as a blog, on our YouTube site and on our Facebook site. The two males associated with the Hollywoods have been seen together, for the first time in a long while and Patrick and his guests were on hand to view the special sight. 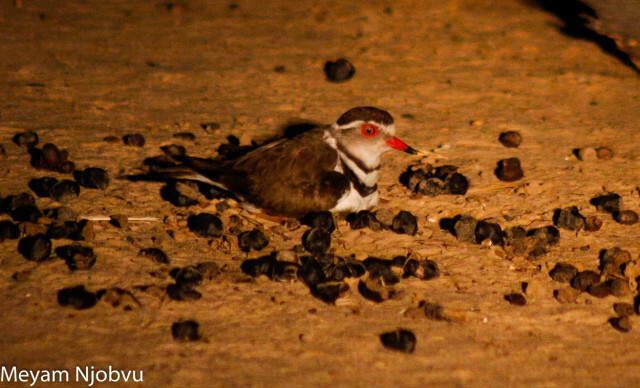 Other lucky guests were also incredibly fortunate to watch a pair of White-tailed Mongooses frolicking and then mating out in the open! 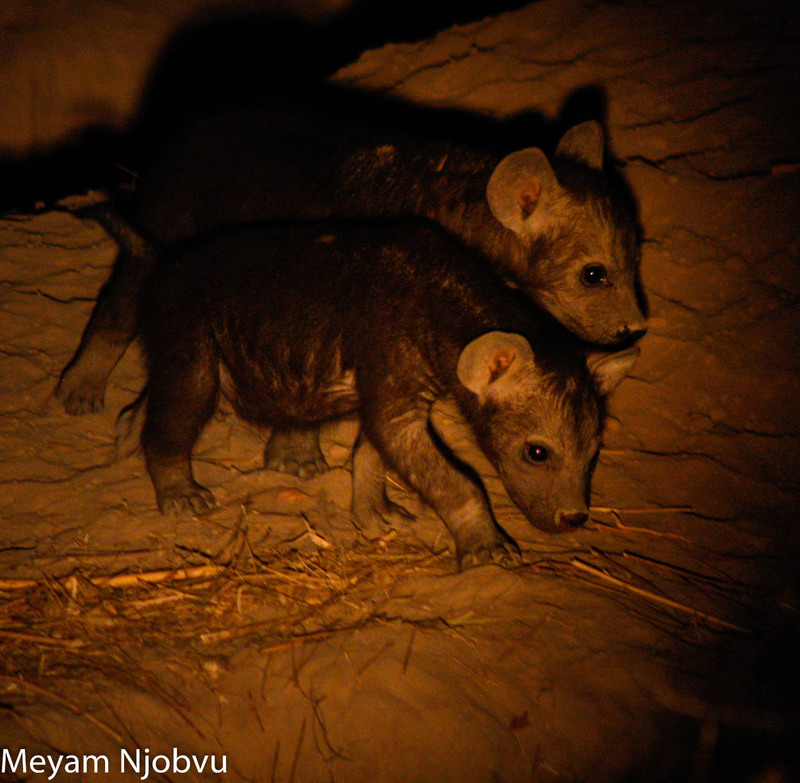 Unfortunately the photograph is a bit blurred . . ..
And at Mwamba Bushcamp the honey badgers are continuing to give us headaches with their nightly raids into the kitchen. Each night our kitchen is well and truly “locked down” with everything either locked inside our large store cage or packed away in metal trunks, which are then bound to the support structures on the walls. The fridge is locked and bound shut, then secured to the wall so the honey badgers cannot pull it over. But every night without fail, they will attempt to climb up the walls of the cage or even attempt to dig down and under the iron mesh encasing the kitchen to gain access. When they fail, a rare occurrence, they flip our garbage cans over and litter the kitchen, which we believe is purely out of spite! They have even made the bar chest-fridge a target, flipping it open and drinking all of the fruit juices . . . and so the battle goes on. 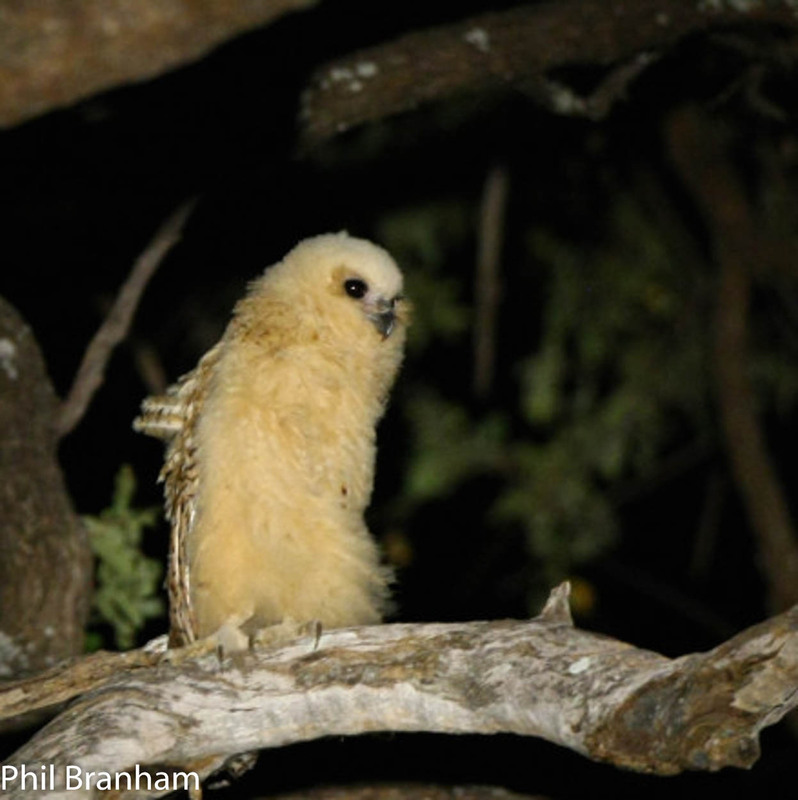 Some of the nocturnal viewing was colourful and some wrenched the heartstrings . . .
A chameleon blushing pinkly as it was caught in the spotlight – Chameleon skin has a superficial layer which contains pigments, and under this layer are cells with guanine crystals. 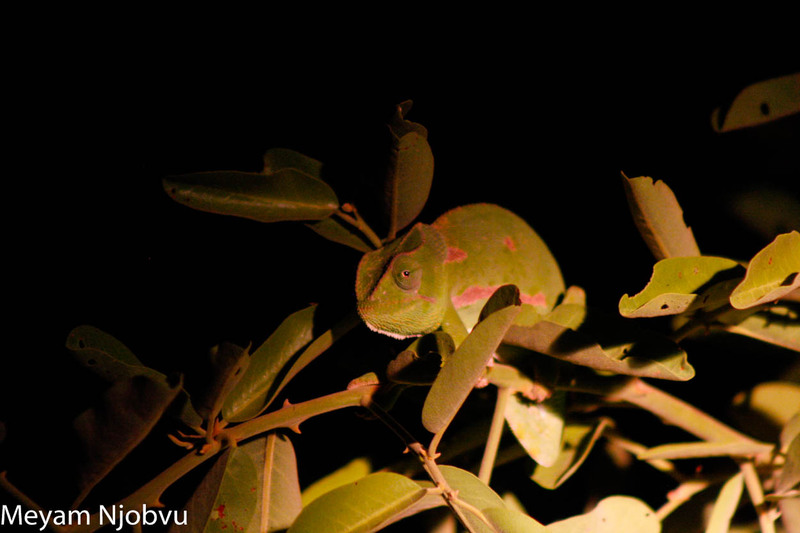 Chameleons change colour by changing the space between the guanine crystals, which changes the wavelength of light reflected off the crystals, which changes the colour of the chameleon’s skin – so actually it is blending in with the green leaves and pinkish thorns of the Capparis. and incredibly difficult to spot at night: a Brown-hooded Kingfisher huddled in a Mahogany. 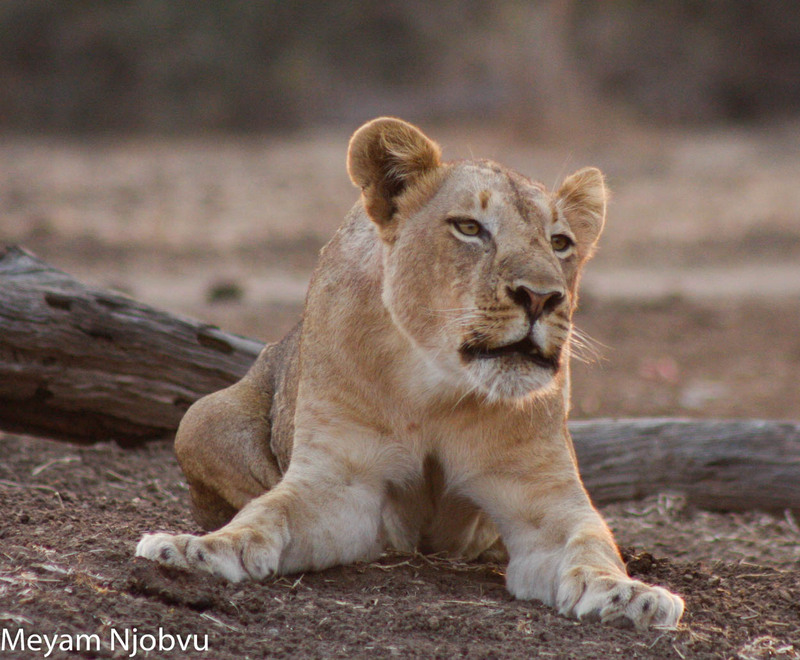 Then there was the lonesome Lioness calling endlessly and without answer, discovered by Meyam and his guests, sitting forlornly near Acacia Grove. 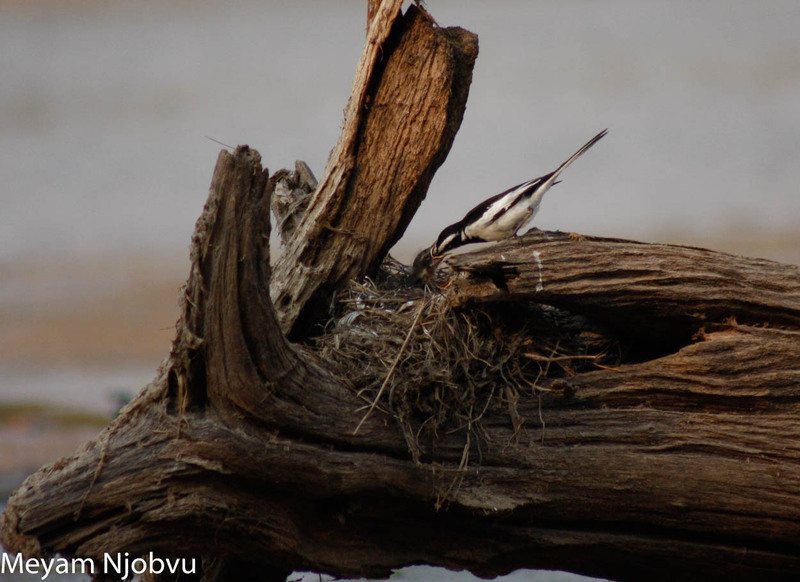 An adult African Pied Wagtail feeds its chicks in a nest metres from the lower deck at Kaingo Camp. The log housing the nest, was an island in the middle of an arm of the Luangwa river, ensuring that the babies were safe from Genets and Civets. 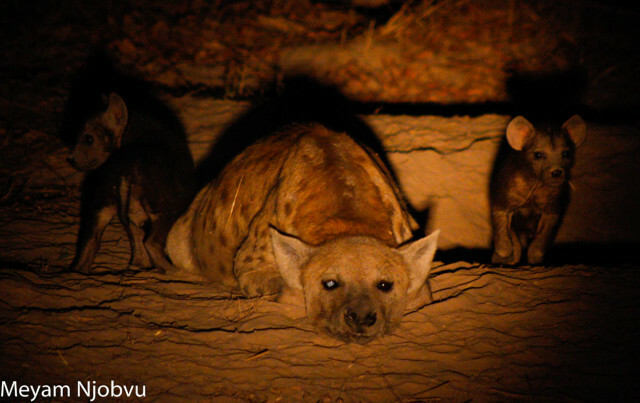 Photo by Phil Branham of a Hyaena driven off its meal by Lions. 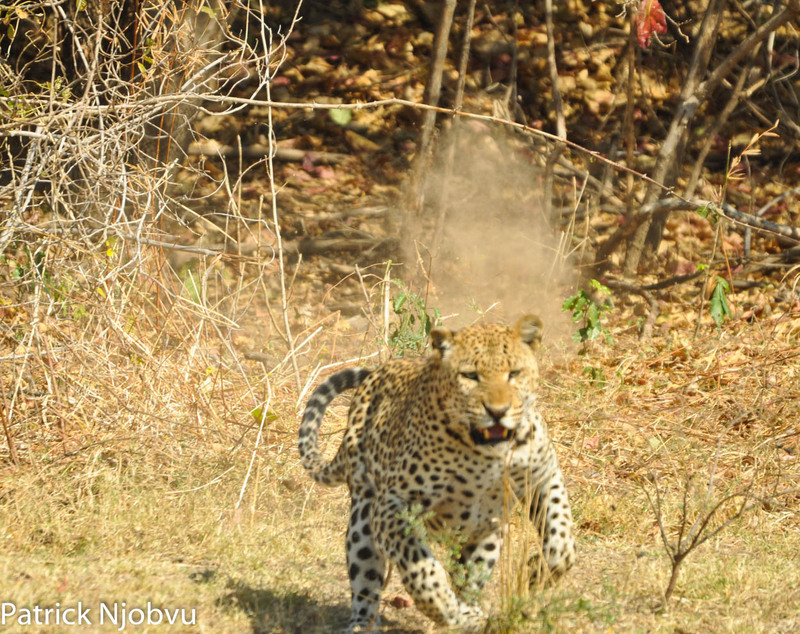 Photo by Phil Branham of Malaika on the hunt. 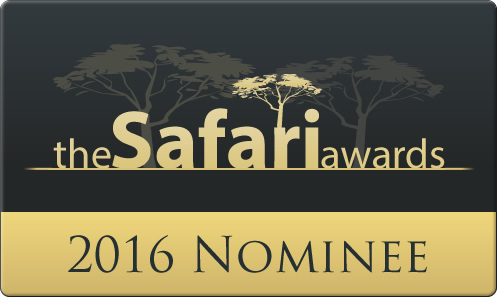 Its that time of year again and voting has opened for the 2016 Safari of the year awards. Please click on the picture to vote for us. Thank you if you took the time to vote for us.